· High-level modules should not depend on low-level modules. Both should depend on abstractions. · Abstractions should not depend on details. Details should depend on abstractions. To simplify this we can state that while designing the interaction between a high-level module and a low-level one, the interaction should be thought of as an abstract interaction between them. Usage Intention : Before understanding the intention of usage, let’s try to understand a traditional application architecture implementation. During the process of the application design, lower-level components are designed to be consumed by higher-level components which enable increasingly complex systems to be built. In this Process of Composition, higher-level components depend directly upon lower-level components to achieve some task. This dependency upon lower-level components limits the reuse opportunities of the higher-level components and ends up in a bad design. From the illustrated diagram, High-level Modules depends directly on Low-level Modules and this does not follow the first point of DIP. Allowing the dependency causes many issues and we have discussed many of them in our first session of this tutorial. For now, we are not going to get into details of those as it’s out of scope of this session. However, we strongly recommend you to refer to the first part of this tutorial before proceeding. Now let’s take a look at button click event example from the Presentation layer that calls directly the Employee Save Method of Business logic which does some validation checks before saving the employee details to DB. This flow looks absolutely fine however we are coupling different layers and as said earlier, any further changes are complicated and cumbersome. Now, Let’s see this problem with a sample code. Notice from the above code the BLL is directly dependent on the low level Data Access Layer and it’s hard to perform any unit tests on this code as both are coupled. Of course, we can do some amount of testing on the DAL but imagine if the DAL needs to be further extended to SQL and XML layers. If we need to that, implementation to extend it, becomes tedious and much more complicated. Hence based on the DIP we apply an Abstraction to decouple these layers. In order to achieve that we introduce interface that acts as abstraction so that both are decoupled. This decoupling is demonstrated in the representation diagram and further we can re-write our code as shown on the screen. If you take a look at this code based on the pictorial representation diagram we have introduced the Interface which is extended by the Data Access Layer and referred in the BLL. Hence we can say that Irepository layer acts as abstraction between these modules. 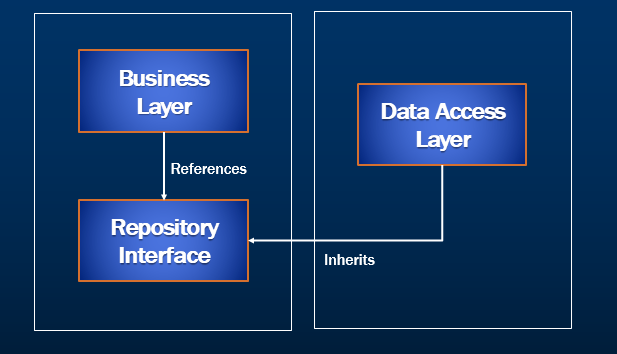 Adapter Design pattern can be seen as an example which is applying the dependency inversion principle. The high-level class defines its own adapter interface which is the abstraction that the other high-level classes depend on. The Adaptee implementation also depends on the adapter interface abstraction.